Lillah lives on Botanica, an island where life, society and culture is dominated by the giant Tree. She has come of age and is about to embark on her journey around the Tree as a teacher. Walking the Tree is the story of Botanica as seen through Lillah’s experiences. Part travelogue, Walking the Tree follows Lillah’s journey around the Tree, from village to village, here known as Orders, detailing the varying cultures she encounters along the way. Each Order has it’s own particular ‘flavour’, derived from the nature of the Tree in that locality. For example, the Order of Aloes make perfume oil from the abundance of jasmine plants that grow there, and this permeates the village society and cultural norms. The sea also plays a role here, as every Order has it’s own distinct relationship with it, some embracing it’s bounty, others fearful of the ‘monsters’ living beyond the shore. Each Order has it’s own version of creation and end-times myths with story-telling being a vital way of passing knowledge on to the visiting Schools while providing insight into the local culture. As Lillah progresses around the Tree, she meets good and bad Orders, and ‘maps’ her journey after each encounter. It is this aspect of the book I found enthralling. It was fascinating to read each version of the myths and how they reflected the personality of that particular Order. Ultimately, Walking the Tree is both a history of Botanica and it’s people, and Lillah’s quest to find her place in Botanica. She is insightful in her observations and learns from her experiences. Her relationships with her childhood friends and the boy Morace are integral to understanding Lillah, her hopes and fears being changed by her journey and the people she encounters. 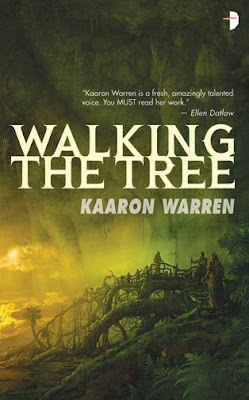 Overall I found Walking the Tree to be easy to read, yet complex human issues are explored throughout. I loved the descriptive prose and how the Tree dominated the lives of all those living around it. In some ways I was reminded of Sherri Tepper and Ursula le Guin, with the female-orientated society and a strong bond with nature being dominant themes in the book. The world-building is amazing, with great attention to detail, yet the balance between Botanica, the Tree and it’s people is never compromised. I can’t recommend this book highly enough. I was hooked from the opening pages and was immediately drawn into Lillah’s world. I feel Walking the Tree is a book that will benefit from re-reading as the earlier sections contain clues to the eventual path Lillah takes. She is a strong narrator and carries the story well, but the ultimate star of the book is the Tree itself. It gives life, nourishes the people, dominates their existence, yet is cruel and demanding in sacrifice, just like nature itself. There are lessons for all of us in Walking the Tree, but my view is that women will identify more with this book and the themes presented within it. PS: This review has been graciously handed down to me from Cara Murphy [@murf61 on Twitter], reviewer and reader extraordinaire, who will also soon be a part of the Temple Library Reviews squad. Great review, Murf is going to be a good addition to an already excellent site.